Editor’s Note: Today we bring you an article from one of our readers, P Tesler. Mr. Tesler is a theme park enthusiast and has traveled around the world collecting photographs and stories from some of his favorite attractions. 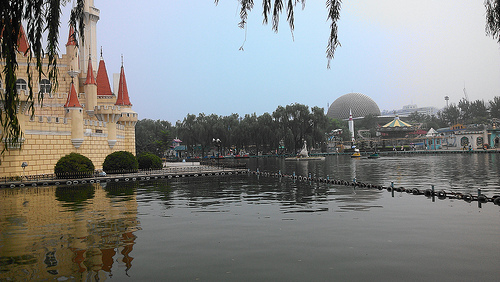 Today he shares with us his experiences at a Shijingshan Amusement Park, which “borrows” many attractions and characters seen in Disney Parks around the globe! Have you ever heard the expression “it’s so bad, it’s good”? Perhaps no motto better suits Beijing Shijingshan Amusement Park, a theme park with a strangely familiar likeness on the outskirts of Beijing, China. Really, the only other motto even remotely fitting is the old official one, formerly found printed in Chinese on a huge red banner hung over the main entrance: “Disney is Too Far, Please Come To Beijing Shijingshan Amusement Park”. I first learned of Shijingshan through a Japanese news report that my friend forwarded to me. 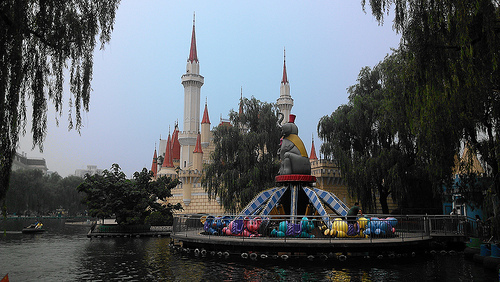 My jaw hit the ground: was there really a theme park in China that was a complete knockoff of Walt Disney World? How many of their attractions were “inspired” by Disney and how do they compare to the originals? Eventually curiosity got the best of me and I decided to pay them a visit. Not much information was available online at the time. 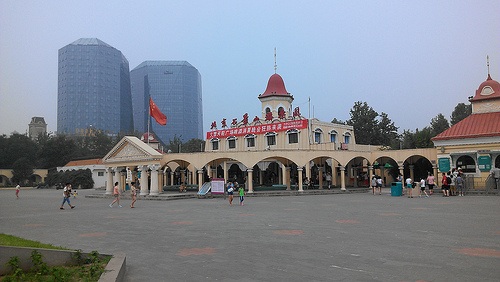 I had read that the park opened on Sept 28, 1986 and was owned and operated by the Shijingshan District government. The park had been using popular Disney characters throughout its venues – as crude walk around characters, on merchandise, and in park decorations – all without permission. Pressure from Disney came in 2007, and all of those characters were removed. The castle, spaceship earth ball, and a number of other familiar attractions remained, however. Eventually the park’s official motto was changed to “Happy Healthy and High”. So off to Beijing metro line 1 it was, and after about an hour on a packed train, I arrived near the end of the line and wandered my way into the park (which was visible from a distance because of spaceship earth peering over the surroundings). 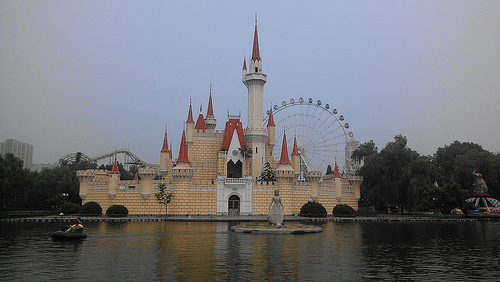 The cost to enter was about 10 Yuan ($1.25 USD), but that’s because they charge you per ride. Think of it as Disneyland’s old pricing model. The very first thing I noticed was that the park was very run down. Many of the attractions were closed or abandoned. Some attractions would open and close depending on guest demand and/or employee availability. The Dumbo-like Elephant Ride, for instance, was closed in the morning. I had also wanted to visit the Haunted House, but in true haunted house spirit the whole place was deserted. I thought about propping the doors open and sneaking inside, but decades of horror movies had advised me to the contrary. This is a good place to note that most of Shijingshan’s attractions are originals and not Disney knockoffs. Roller coasters are popular here, as are other thrill rides you’d normally see at an amusement park – anything that shakes, spins, or throws you around. There was also a big ferris wheel and lots of kiddie rides. It took a while to find, and required crossing a bridge over railroad tracks, but I finally found Main Street – which, interestingly enough, they call Dream European Street. The reflecting pool in front of Cinderella Castle (as it is known) added a nice touch. The park wasn’t crowded at all, even in the middle of July, so I had plenty of breathing room. I did notice that the score from the Japanese movie “My Neighbor Totoro” was being used as the background music. I thought it was a charming fit, though I’m still not sure they received permission to use it! 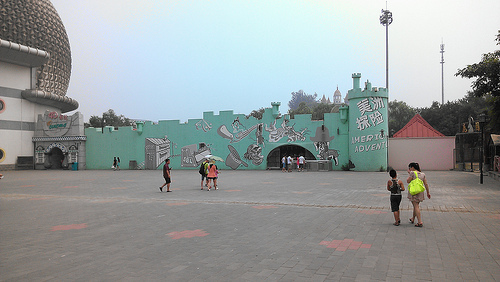 Inside the castle are three attractions, all accessible from the rear entrance. 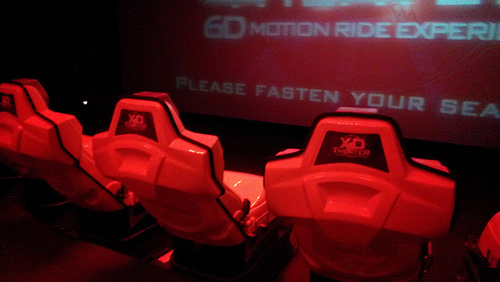 First was the 6D Xtreme XD Theater, which cycles through a set of different 3D simulations (I got to see a roller coaster simulation). You sit in big pink seats that jolt back and forth and side to side. Surprisingly, it wasn’t half bad. The funniest part was the entrance queue – where you see a pail for collecting water from a ceiling leak, a crummy display featuring a bunch of transformers dolls, a Christmas tree (in July), and three “cast members” in their street clothes standing around a PC. 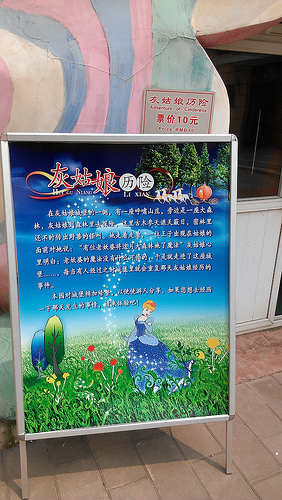 The castle also houses the Adventure of Cinderella walkthrough, which seems like a collection of random mannequins which have no apparent connection to the story of Cinderella (including the Chinese version of Cinderella, Ye Xian. The whole walkthrough is dark and a story recorded in Mandarin plays in the background. On the other side is the Mystery Castle, which has a similar walk through, except afterwards an employee directs you into a tea party room with lots of headphones on the table. 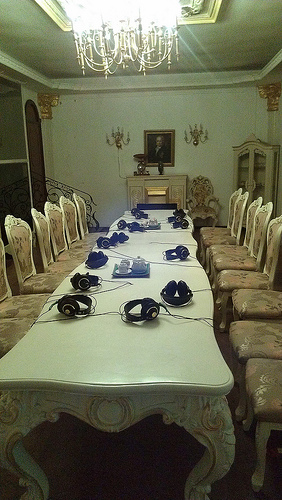 You sit down, put the headphones on, all the lights turn off, and for the next 10 minutes they play a track of really creepy ghost sounds, shrieks, screams, etc. At one point lightning flashes outside. After about 3 minutes of this, I had enough. I turned on my phone’s flashlight and waited it out (I was the only one there). The American Adventure ride was exactly what its mural entailed – shooting up cowboys in the dark from continuously moving omni-mover style vehicles. The “score” display turned out to be nothing more than flashing lights, as seen in the video. No score was kept – you just pull a trigger on a plastic gun and it would make a zapping sound. Most of the cowboys were stationary mannequins, a few of them moved back-and-forth horizontally, and one had his head spinning 360. Next I did the 4D Cinema that’s lodged in between the big gray EPCOT-style ball and American Adventure. While waiting in line outside, I spot a small boy using a sewer as a very public restroom. His father rushes over, but only to help him keep his balance. Meanwhile, a shirtless man with a back full of tattoos is crouching down and smoking. After 20 long minutes in the sun, the theater’s doors finally open. The movie turned out to be a 10 min computer animation about a protagonist car racer who takes on the bad guys on the racetrack. The screen, however, wasn’t properly calibrated with the glasses and the double image effect that you see with your glasses off was even worse with the glasses on! Halfway through the movie most of the audience had their glasses on their foreheads. 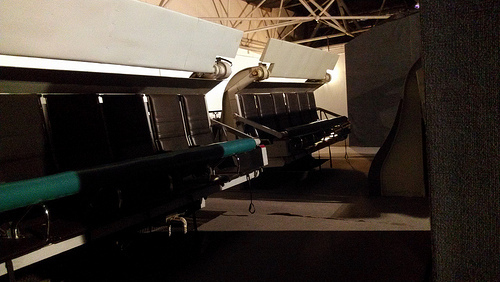 The seats would suddenly jolt up or down from time to time, similar to those used in Shrek 4D at Universal Studios. They also blew air in your face and feet. Most notably, after the movie my sweaty glasses went straight into the bin for use by the next batch of guests, as opposed to going through an industry-standard hot water cleaning process. Needless to say, I didn’t like the 4D Cinema. 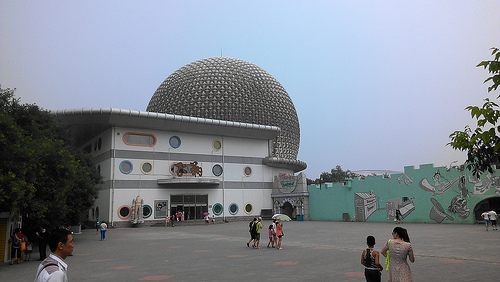 The big gray ball turned out to be the home of an attraction called “Soar’in the Sky”. At a cost of 50 Yuan per ticket (that’s $6.25 USD), this one was looking up to be a true E-Ticket. The attraction runs once an hour from 10 AM to the park close at 5 PM. The doors remain closed at all other times. When it’s time for a screening, an employee opens up the front doors and a small crowd gathers in the lobby. I was among about fifteen people who were riding the 1 PM. Inside are various model airplanes as well as posters for all the different destinations you’ll get to visit: more than half of them are in China. Found on the floor is another ceiling leak pail, various handyman tools (without an associated handyman), and a motorcycle. 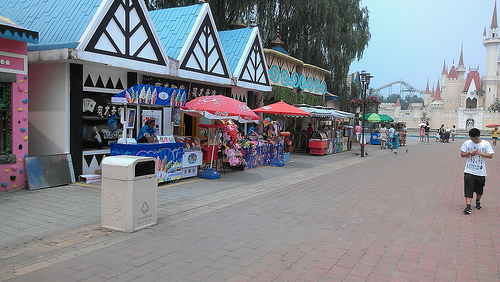 The food at Shijingshan ranges from the typical amusement park fare to the exotic. As translated into English, a lot of the menu sounds disgusting. I tried the “Ascloselylinkedasfleshandblood”, “Golden Chicken”, and “Toothpick Meat String”. Typical low-cost amusement park food. All of it was okay, except for the “Golden Chicken”, which was a little cold and had hard parts inside. 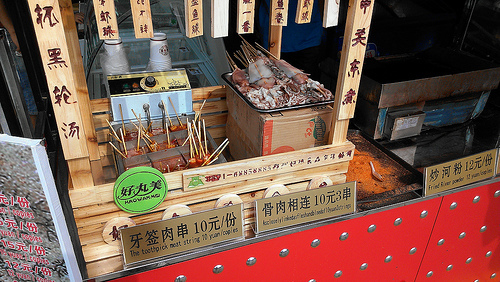 My favorite, though, was the cantaloupe slice on a stick. A true Chinese street classic and a real delight on a hot summer’s day. I had two of those! 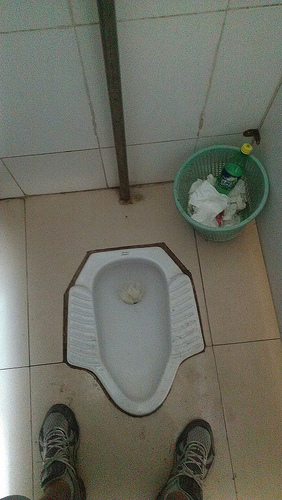 To a Westerner like me, Beijing Shijingshan is obviously subpar. I’m also not a fan of blatant copyright infringement. My biggest draw here was the comic value of an amusement park that tried to copy a bunch of Disney attractions. To be honest, I think I laughed more here than at any other place in Asia. But for the locals, this place is something much more serious. The kids were having a ball, and that’s always a good thing. There are things here that I would want changed. But overall, I’m glad that the 20 million people of Beijing (many of whom can’t afford to leave the city) have somewhere to go. I’ll be patiently awaiting the opening of Shanghai Disney Resort around 2015, and will hope that its competitive pressure will force Shijingshan to clean itself up. But if Shanghai Disney is still “too far”, you can bet that people will heed the call and “come to Beijing Shijingshan Amusement Park” instead. Editor’s Note: If you would like to see more of Mr Tesler’s photos, click here to view the full album from Shijingshan Amusement Park. And for more stories on the world of themed entertainment, click here to follow TPUJosh on Twitter and click here to like TPU on Facebook! 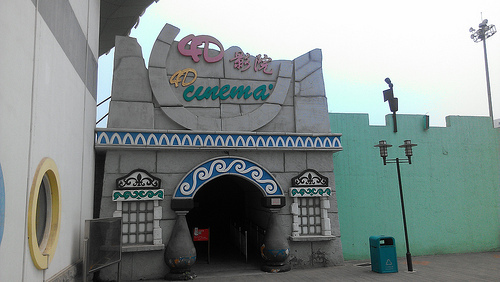 This entry was posted in International Parks, Theme Parks 101 and tagged 4D Cinema, 6D Xtreme XD Theater, American Adventure, Beijing Shijingshan Amusement Park, Disney Knock Off, Dream European Street, Dumbo, Fake Disney, Mystery Castle, Soarin In The Sky. Bookmark the permalink. Trackbacks are closed, but you can post a comment.